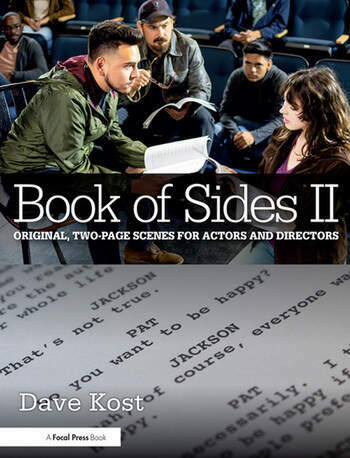 Book of Sides II: Original, Two-Page Scenes for Actors and Directors is the second book in the Book of Sides series by Dave Kost, featuring original, two-page, two-character scenes for use in acting, directing, and auditioning classes. While shorter than the traditional three-to-six-page scenes commonly used in classes, Book of Sides II features longer scenes than the first Book of Sides with greater character development, more reversals, and stronger climaxes. Simple and conducive to performing in a classroom without sets, costumes, or special props. This book was written by an educator for educators and designed for use in the classroom. Never search for scenes again! A prolific filmmaker and accomplished educator, Dave Kost has written, directed, and acted in numerous award-winning short films. He is a professor at Chapman University’s Dodge College of Film and Media Arts, where he has teaches filmmaking, directing, and acting, and created educational materials used around the world. "Anyone sick of those tired and done-to-death acting scenes will welcome Dave Kost's terrific new collection of bright, edgy, often emotional scenes. Fresh gems for classes and auditions." "Always smart, layered and compelling, these scenes are perfectly suited for teaching actors and directors learning to work with actors — with the flexibility to lean toward drama, comedy, or mystery, these scenes offer a deep dive into character nuance and a depth of conflict that serves the exploration of staging and visual storytelling." "Dave Kost has developed a one-of-a-kind resource for instructors: short scenes with actual substance. This book is ideal for training actors and directors, with rich material for classroom scene work, auditions or cold readings, and on-camera work. Book of Sides is invaluable and unparalleled."